As soon as the food lockers, water and fuel tanks were full I left the Flamenca anchorage and headed for the Perlas Islands. 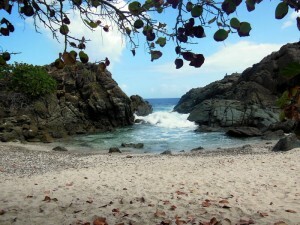 My first stop was Contadora. It was my final opportunity to use the internet and I was able to settle the last of the outstanding problems I’d been having with my rental property in Hout Bay. 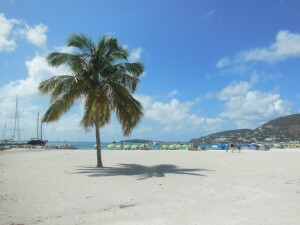 A pretty island with an exquisite powdery white sand beach. On 8th May, which happened to be my 70th birthday, Debbie and Bob arrived on the yacht ‘Dakini’ which they are delivering to Australia. The owner, Renata, was with them for the first leg of the trip and I spent the evening with them in their luxurious cockpit. Then I moved on to a few more beautiful spots among the small islands spending my last night at the southern most tip in a sheltered bay at Punta Cocos. 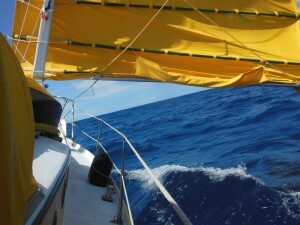 On 15th May I started the voyage to the Gambier Islands in French Polynesia. 3800 miles to go. I did not plan to stop at the Galapagos Islands but wanted to pass north of them so I headed off in that direction. Winds were variable with calms and squalls. A strong current slowed us down. After a few very slow and uncomfortable days, I changed my tactics and turned south hoping to encounter more favourable winds. This was a good move and we made encouraging progress to the south before turning west again. I had been able to pick up the occasional weather fax using my SSB receiver and the app on my tablet. It showed SW winds until a little south of the equator. I pressed on, slow and uncomfortable. After nearly a month we were approaching the Galapagos. I stuck to my plan to pass north of them. There was an amazing number of birds in the area. 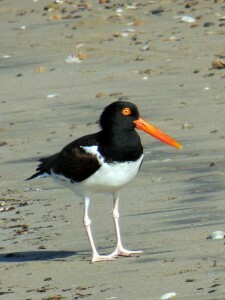 Many boobies, masked and red-footed. The red footed variety decided that Speedwell made an excellent roosting place and at times I had as many as 10 or 12 birds squabbling over the best places to perch. One actually got down below. A big bird. I had to lift him up and put him outside as he was very clumsy with his enormous wings in the confined space down below. I kept heading West for a few more hundred miles and crossed the equator at 95° W. Now I could turn and head directly for the Gambier archipelago. For some days we had really good weather and I thought it was going to be an easy ride. Not so. The weather became very fickle with many days of intermittent squalls and calms. Then there would be a spell of strong NE which I took full advantage of. Unfortunately during one strong blow I heard a loud ‘crack’, which must really have been loud as I wasn’t using my hearing aids and it still startled me. I looked around to see what could have caused it and saw that the second batten from the top had snapped neatly in two about a third of the way from the leech. I hove to and lowered the sail so that I could reach the broken batten and managed to lash it snugly to the next one down. I left the sail reefed as the wind had strengthened and the sea was quite rough. We carried on like that for a few more days until the weather moderated again and I raised the remaining panels. It looked alright and was not going to be a major problem. But, I had been struggling all along to get the Navik to steer accurately and it wasn’t doing a very good job. There seemed to be a lot of play at the supporting rod and it was wobbling about. Wear and tear I thought. I hung over the stern to get a proper look at it and saw to my horror that the linkage to the paddle had broken off leaving it flopping helplessly about. It was a part that I had had repaired by a welder in Puerto Lindo. I lifted the paddle assembly in and stowed it safely below. I couldn’t see how I could fix it with the tools I have on board so I would have to reconcile myself to managing without it. Just under 2000 nm to go and mostly dead downwind. I searched around and managed to find a suitable length of sturdy bungee cord which I looped around the tiller and tied off to a handy cleat on the side of the cockpit. Then a rope to the opposite side made it possible to fix the helm in position and balance the sail to hold us on a steady course with the wind roughly on the beam. The sail needed to be sheeted quite tightly in to maintain a reliable heading so we were not sailing very efficiently but it was a workable compromise and freed me from having to sit permanently afixed to the tiller. I had not taken in the wind vane part of the Navik and it made a very useful indicator of our attitude towards the wind which I could see from down below. Day followed interminable day. When we strayed too far off the rhumb line I would gybe and have to spend a while getting the steering settled again. I had plenty of reading material and became addicted to a killer sudoku app. I kept a detailed log and found plenty of small maintenance jobs to do. I had enough water and was managing quite happily on 1.5 liters per day. Using sea water for washing and some of the cooking water. I baked bread and crunchies and tried out new recipes using the pressure cooker on my primus stove. On the good days I was happy to just sit in the cockpit enjoying the endless view of the ocean. Once past the Galapagos the birds virtually disappeared except for an occasional shearwater or petrel swooping and soaring elegantly about us before disappearing in the distance. I had seen a small group of dolphins soon after leaving Las Perlas but no more for the rest of the trip. 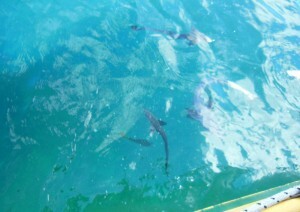 A group of Mahi-mahi or dolphin fish stayed companionably with us all the way. They were about a meter long and brilliantly coloured with an iridescent blue body and bright yellow fins. Quite spectacular at night as I had a bright cockpit light which they seemed to be attracted to. After some weeks the broken batten started to cause problems with the sail and as soon as there was a calm day I hove to and was able to remove it completely and stow the pieces safely below. The sail was chafing badly where it rubbed against the lazy jacks despite having covered them with plastic hose. All along I had resisted using the engine as it would have not been much help against the awkward currents approaching the Galapagos and I don’t carry enough fuel to do long distances. However, as we were nearing the point where we only had 1000 miles left to go the wind dropped completely and I decided to motor for a few miles just to cross this important psychological threshold. It started easily but, oh dear, no water coming out of the exhaust. The cooling water inlet must have become overgrown with barnacles. I shut it down quickly to avoid overheating. I considered going over the side and trying to clear it but was not brave enough. So we waited for the wind. I became so accustomed to the leisurely pace of life on board that I was not particularly anxious to arrive but I realised that people might be starting to wonder what had happened to me. With only 50 miles to go we had two days of bad weather which stopped us in our tracks but at last when it cleared I was able to see the islands. 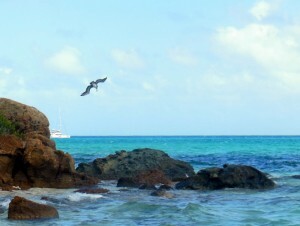 A tropic bird flew by. It seemed we had almost arrived. At 4pm on 4th August I turned in to clear the entrance through the reef. There was just enough wind to keep us moving. Dark comes quickly after sunset in the tropics and we still had about 10 miles to go before the first possible anchorage. Fortunately the Navionics charts on the app I was using are very accurate and I decided to carry on putting my faith in the GPS. The water in the lagoon is deep with coral heads scattered about. Now it was pitch dark and the wind was dying. At last we reached a designated anchorage area where I found depths of just under 20m and decided to stop right there. Dropped the anchor, popped the bubbly and celebrated life. Early the next morning I found my mask and snorkel and went over the side to clear the cooling water intake and check the prop for barnacles. Got the engine running and we motored the remaining 10 miles to the anchorage at Rikitea. I had read so many dire warnings about the rough sea conditions along the NE coast of Colombia that I was feeling rather anxious about starting out. I had a reasonable weather forecast but in order to reach my first safe harbour at Cabo de la Vela, 500 miles away, in good weather, I would have to be able to maintain at least 100 nm per day. Seeing as I usually estimate my trip times using an average speed of 3knots I would have to push it. When I left Ponce the wind was about 15-20 knots from the East. We raced along with the wind on the beam, despite a rough and bouncy sea. The ocean swell rolls in from the NE and crosses the wind waves coming from the east causing nasty confused water. I took a seasick pill just to be safe. The first day went well and we managed to maintain an average speed of 5knots. It was looking good. But the strong conditions were starting to take a toll on the rig. Over the next 3 days I had to heave-to four times in order to fix small breakages: two batten attachment lashings chafed through on separate occasions, a stitched tab for the attachment on yet another batten pulled apart, a small saddle screwed to the boom for the tack line came adrift. Each time I needed to clip on and only use one hand to replace lashings, stitching or screws while trying to ignore the rather exciting movement of the boat and hang on for dear life with the other. Once again I was thankful for the ease with which it is possible to heave-to with Speedwell. A rather more serious breakage happened just before sunset on day 3. I was below taking a short rest and the movement was quite rough but steady. Suddenly I felt a change and things seemed ominously quiet. Then we suddenly gybed. I dashed up on deck to see what had happened and to my dismay saw that the long connecting rod on the Navik self-steering gear had come adrift. Oh well, it had happened before and fortunately I had a spare. So we hove-to once again and I perched on the stern rail and unscrewed the Navik to bring it inside. Fortunately I was able to remember where I had stowed the spare and we were soon back in action again. I thanked my lucky stars that all these mishaps had occurred during daylight hours. Day 4 and we were approaching the other side. It might be possible to stop at Aruba if the weather turned nasty but I really didn’t want to have to to this, as they feel that South Africans should have a visa (which I don’t have) and their harbour fees are exorbitant. I steered towards the small Archipelago of Monjes which is part of Venezuela and could provide refuge in extremis. 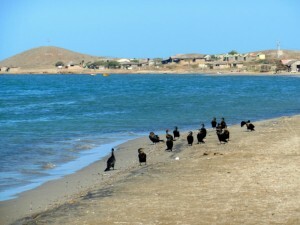 But things didn’t look too bad so I bravely kept going, heading along the coast of the Guajira peninsula. There was a fairly big swell but nothing too horrendous. 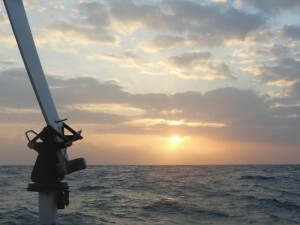 As the sun came up we rounded Cabo de la Vela and anchored in the flat water of Ensenada Huaritcheru. Fishermen were out in their open boats. It was a beautiful scene. I tidied up the sail and had a few hours sleep. It was too windy to even think about rowing ashore so I spent the rest of the day sorting things out aboard. 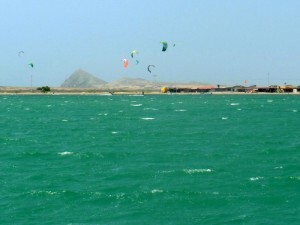 Kite boarders were enjoying the breeze and the flat water. Some whizzed by really close to have a look at us. We were the only cruising boat there. What a change from the Caribbean. Next morning it was flat calm. I got the dinghy in the water and took the opportunity to row ashore. A perfect beach for landing with no waves breaking. I took a long walk along the water’s edge. I hadn’t expected to arrive in a desert area. 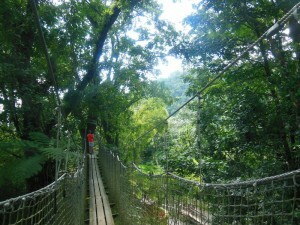 I imagined Colombia to be all tropical rain forest and lush greenery. This was amazing. Wonderful dry air for a change. There are a lot of simple shelters all along the beach, mostly open sided with palm thatched roofs and posts for slinging hammocks. All catering for visitors and weekenders coming to enjoy the superb kite-boarding conditions. A narrow sandy track follows the coastline. Every now and then I stopped to watch the local Wayuu Indian fishermen and their families busily cleaning the morning’s catch. 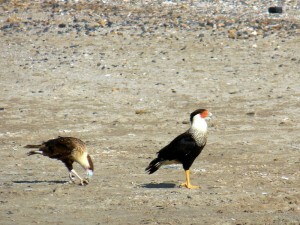 Any bits and pieces left on the sand were quickly taken care of by the Crested Caracaras that looked on expectantly. Everyone seemed friendly and identified me with the little yellow boat anchored in the bay. One of them wanted to swap hats with me. He had a rather splendid panama job but I’m attached to my special hat and couldn’t bring myself to give it up. No offence. Thumbs up sign. On I wander. Further along I spotted a beautiful American Oystercatcher being followed by a little sanderling and a pair of turnstones. Next there was a gaggle(?) of cormorants who took to the water when I came too close. Pelicans were fishing a short way off and there were terns and frigatebirds. Oh, why hadn’t I brought my binoculars? I was tempted to keep walking and visit the lighthouse up on the hill, but the wind was picking up again and whitecaps were starting to appear on the water. Time to head back. It would be a fast downwind row and heaven help me if I got blown past the boat. Apparently, this is the normal daily pattern – the wind picks up really strongly starting at about 11am reaching a peak around 2-3 in the afternoon and then dying down again at night. Nevertheless, the bay provided a very comfortable anchorage completely protected from the swell. 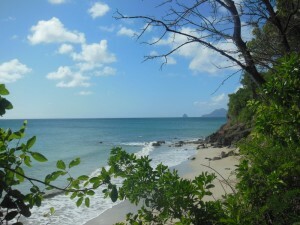 I spent most of February anchored in Marigot Bay on the French side of St Martin. 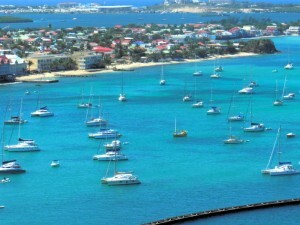 A vast anchorage with hundreds of boats, many of them giant catamarans. South Africans are not allowed to check in on the Dutch side without a visa which, of course, I did not have. 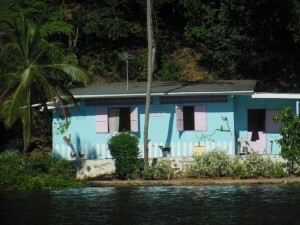 The French are more accommodating and its a short bus ride from Marigot to Philipsburg with no stops or checks at the hardly noticeable border. I had been using up my hoarded ship’s stores, most of which were way beyond their ‘best by date’, and needed to restock. This involved many trips to the supermarket, each time buying only as much as I could carry for the roughly half-mile walk back to the dinghy dock. There was a wonderful variety of stuff, practically all imported, but no tax was payable and the prices were reasonable. At last my big food locker under the port side bunk was full to the brim and the credit card was exhausted. Time to move on. I had to wait out a few days of strong westerly winds which made the anchorage extremely uncomfortable. The rough weather also brought some rain and obligingly helped to fill my water tanks. 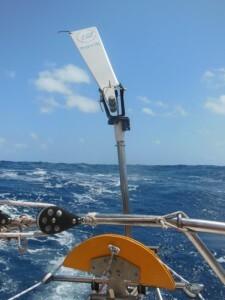 At last things calmed down and I had superb weather for the 80nm sail to Virgin Gorda in the BVI. A gentle F4 SE breeze with calm seas and sunny skies. This must be just about as good as it gets. The dark, moonless night was lit by brilliant stars and sparkling phosphorescence. I arrived at the entrance to North Sound at about 9 on Saturday morning and was able to sail right up to Gun Creek where I dropped the anchor and rowed in to the convenient dock next to the customs office to clear in. They are open on Saturdays and Sundays from 9am to 2pm with no overtime charges. Next morning I motored around North Sound looking for a good place to spend a few days. 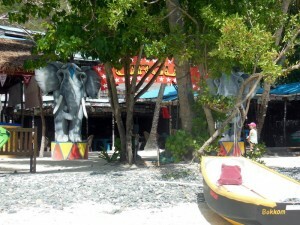 And came face to face with the harsh reality of the booming tourism industry. All the popular, and therefore good, anchorages are swamped with mooring balls with monster catamarans attached, leaving the only available places to anchor far away from the shore and often in deep water. Not too much of problem when the water is calm and the wind gentle but now the wind was keeping up a steady 20 knots and all the available anchoring places were very rough and choppy. Maybe this is why catamarans are so popular. Of course, they also all have big inflatable dinghies with powerful outboard engines. Getting ashore is not so much of a battle. However, rowing a light dinghy in a heavy chop against a strong wind is not one of my favourite pastimes. As it was impossible to get ashore, the shoreside attractions had to be forgotten and I found a lovely comfortable anchorage in the lee of Prickly Pear Island protected by a reefy bit. At least here the water was flat although the wind still howled down over the rocky cliff in regular williwaws. The holding was good and I could enjoy snorkelling around in the beautifully clear water. A big, resident Green Turtle regularly patrolled his domain and I enjoyed watching him (or her?). Way, way back when I was living in Hout Bay, South Africa and still just dreaming about going cruising I met Julian Putley while he was building his boat, ‘Starry Night II’. His girlfriend, Monique came over from Brazil to join him when the boat was ready and they sailed away to Virgin Gorda and I lost touch with them. Now, about 25 years later, I was paging through a copy of ‘All at Sea’, a local free monthly magazine that he writes for, and I read one of his regular humorous articles. There was no contact information, but just then someone called my name and powered up in a big dinghy. Not Julian but Will, another old acquaintance last seen 12 years ago at Flores in the Azores. He promised to try to look up Julian for me. It was obviously meant to be. 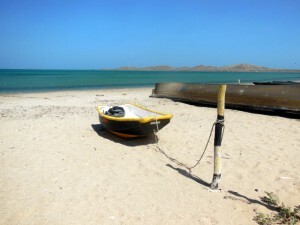 A few days later I was waiting out a really strong blow behind Marina Cay, when Julian roared up in a powerful inflatable armed with a bottle of KWV Pinotage, a couple of books he has written and a bag of chocolates. He and Monique now have a house high up on Sage Mountain on Tortola and when I moved around to Cane Garden Bay I was able to join them for dinner. It was quite an occasion seeing them both again and reminiscing. Cane Garden Bay was a very pretty anchorage and so, also very popular. Most of the bay filled with moorings and most of the beach filled with plastic deck chairs for hire. Lots of bars and restaurants. I managed to find a place beyond the moorings, just inside the reef. There I met Sean, anchored on a small boat quite close by. He had arrived after almost a full circumnavigation having started out from California. No engine, hanked on jib. He was working on hand-stitching a patchwork crab claw sail for a friend’s kayak. He finished it just before I left and I was able to get some pictures of him trying it out. 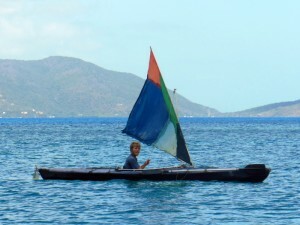 A big swell had started breaking on the reef near to me and I decided to sail over to Jost van Dyke in search of a better spot. Although the anchorages are not always as good as I had hoped they might be, the sailing in between was always wonderful. Normally I only needed to raise 4 panels and I would be skimming along at 5 knots. I carefully planned my route around the islands so as not to have to do too much back-tracking and find myself having to beat up against the wind. After an abortive attempt at finding room to anchor between the big boats at Sandy Spit I retreated to a reasonably comfortable spot close to the B-line Bar on Little Jost van Dyke. I was able to row across to the other side of the bay and found the path that leads to the Bubbly Pool where waves come crashing through a gap in the rocks and rush into a smallish pool. Swimming there is only for the brave. 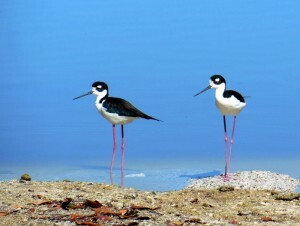 On the walk back I stopped for a while and watched some Black Necked Stilts foraging around the mangroves. 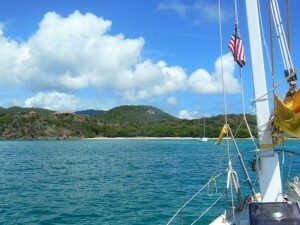 It was a short sail to Cruz Bay where I could clear in to the US Virgin Islands. Plenty more exercise for my old arms. There was no space for me in the tiny area reserved for anchoring inside the protected part of the harbour and I had to retreat and anchor outside off Lind Point. Not a bad spot, but the wind had picked up again and it was a long, hard, rough row to get to the customs dock. The massive wakes from constant water taxis and ferry boats didn’t help. 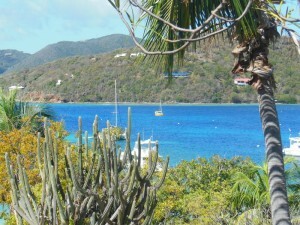 People on some of the big white boats who had seen me recently in Great Harbour, Jost van Dyke, shouted their encouragement. Clearing in went smoothly and I walked up to the nearest supermarket to get a few essentials. On the way I had to negotiate a mad throng celebrating St Patrick’s Day. I really am out of touch. When I eventually got to the supermarket I realized I was back in the US. Air-conditioned with well stocked shelves and fresh fruit and vegetables. I indulged in a bottle of Cruzan Rum. Back at the boat, I dumped the shopping and set off straight away to a quieter spot in Rendezvous Bay on the south coast. 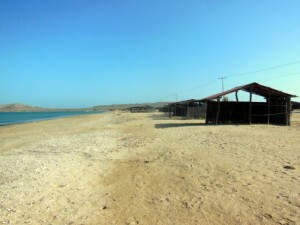 It is a well sheltered bay outside of the National Park area so there are no moorings and no charge for anchoring. The water was crystal clear and there was only one other boat there. A wonderful chance to relax after the crowds and commotion of the last few days. I had a cooling swim and soon it was sundowner time. To my delight I was also able to pick up a usable, open Wi-Fi signal and keep in touch with the weather forecasts. Things seemed fairly settled and I decided to enjoy a few days just chilling out in this lovely spot. The snorkelling was good and I loved watching brilliantly colourful little fish just going about their business on the reef. One day while giving the hull a bit of a brush down I was a little nervous of a really beautiful silver barracuda that was keeping me company. He stayed a polite distance away but I kept a cautious eye on him and his mouthful of sharp teeth. The weather forecast for Wednesday looked reasonable for the 35nm trip to St Croix and I made a really early start to be sure of arriving before dark. Unfortunately the westerley running current seemed to be setting me off course and with the wind blowing a bit more from the south than was ideal, I had to resort to motor sailing to make it in daylight. Well it gave the battery a much needed charge. 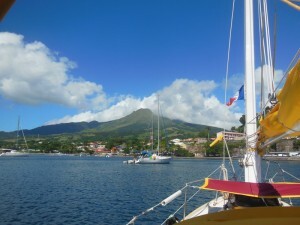 The anchorage at Sainte Anne is big and well protected and very popular with cruising boats. I managed to find a place a short row from a small floating dinghy dock and was happy there. Good swimming and old friends on other boats. The village is picturesque and it was a pleasant stroll from the dinghy dock along a shady road to the small supermarket in the village. I was running rather low on provisions as I had thought I would wait to stock up in Martinique rather than Carriacou where the choice is on the limited side. What a treat to buy good bread, cheese and reasonably priced drinkable wine again. It was a short bus ride to Marin where there is a big supermarket and some interesting chandleries. It rained often enough for my water-catching system to keep the tanks filled. A footpath follows the coastline and I had a leisurely stroll along it one day. A beautiful walk although there were some patches where I was slithering about, ankle deep in mud. I didn’t get as far as the nudist beach at Salines, in fact, I was only told about it a few days later. Ah well, another time. After a week or two I felt the need to move on to Fort de France. Not as much of a holiday destination as Sainte Anne, but more convenient access to the supermarket and interesting shopping in town. Frequent ferry boats crossing to Trois Islets on the other side of the bay are a bit of a nuisance, as they create a ferocious wake as they pass through the anchorage regularly throughout the day. Thankfully they don’t run at night. On an impulse, one day when I was passing the ferry dock I decided to take a ride across to the other side to see where they went. Most of the other passengers were typical European holidaymakers, all suitably shod, hatted and slung with cameras for their Caribbean Interlude. A notable exception was a young rastaman with his wife and small son. As the ferry was docking at the other side, he took off his shirt, hitched up his low-slung trousers and casually dived over the side from the open upper deck where we were sitting. I exchanged delighted grins with his wife and kid. 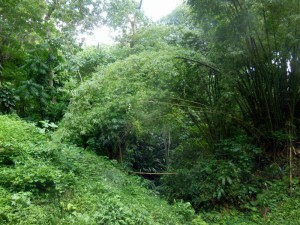 On another day I took a no 24 bus out to the Jardin de Balata, a wonderful botanical garden up in the highlands of the interior. It was a green paradise. 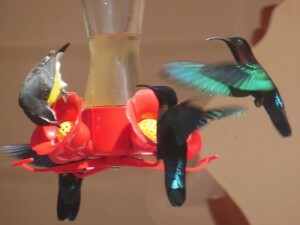 On the verandah of the old house that one has to pass through to enter the gardens, they had hung some bird-feeders filled with sugar water for the hummingbirds. I watched for a while as the birds enjoyed their treat. An opportunistic bananaquit also got his share. Tearing myself away from the birds I wandered through the magnificent garden. An elevated rope walk high up in the canopy was irresistible and I bravely made my way along it imagining I was an intrepid natural scientist a la Attenborough. All too soon it was time to get back to the bus stop to catch the last bus back to town. 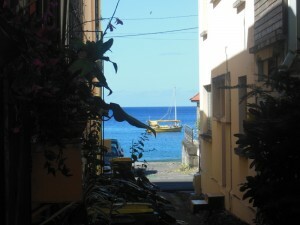 A few days later it was on again to St Pierre. A necessary stop for me as it is one of the few places that I know of where I can find spares for my Primus stove. The little corner shop was still there, but the stoves were all gone. The old man behind the counter allowed me to scratch through a box filled with bits and pieces that had been left over and to my delight I found a single new burner which I was very pleased to buy as a spare for when the current one gets too carbonned up to be useful any more. I do have a box of old used burners but having a brand new one in reserve is wonderful for the peace of mind. St Pierre’s other claim to fame, is the fact that in 1902 it was totally destroyed when the volcano, Mont Pelee, erupted and the 30,000 residents were almost instantly killed by superheated gas that blasted down from the mountaintop. The bay is filled with the sunken wrecks of the ships that were anchored there at the time. A weather forecast showing good SE winds for a few days soon had me getting ready for the next leg of my passage and on to Antigua. By the middle of September I had been in Trinidad for my allotted 3 months and had to decide whether it was time to leave and brave the remainder of the hurricane season in the more vulnerable islands further north or apply for an extension of my stay for a further 90 days after which it would be a safer time to leave. Ever cautious, I opted for the extension. It involved a visit to the immigration office in Port of Spain and an outlay of $TT500, four hundred of which, being the penalty for having a South African passport. One tries to get used to it. Once my extended stay was assured, I arranged to get hauled out for a quick antifouling job and a few other routine maintenance issues. 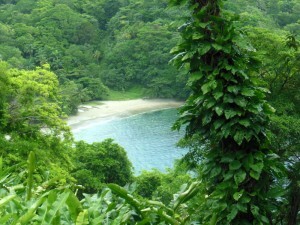 I had spent a month anchored in Carenage Bay just around the corner from the Chaguaramas anchorage. 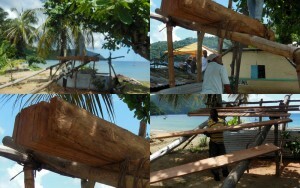 The Trinidad and Tobago Sailing Association has their clubhouse there and it was a comfortable place to be. 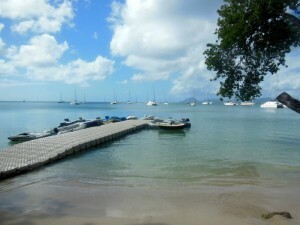 A nice floating dinghy dock, bar, shower facilities and swimming pool. What more could one want? Unfortunately it is also wide open to the prevailing wind and swell. All the club boats are on fore and aft moorings facing into the weather. Visiting boats may anchor outside the mooring field, which is what I did. All was fine until the first time the wind picked up and then the anchorage became almost untenable. I would certainly have moved on if I hadn’t already paid to stay for a month. But I grinned and bore it and on the bad days had to just stay on board as it was too rough for me to row ashore. 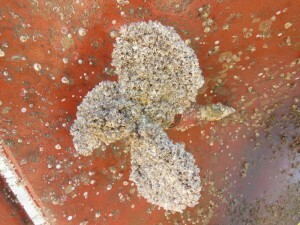 When the time came to move to the Travellift dock to be hauled out I found that the prop had become so fouled with barnacles that we were unable to move under power. Not able to even make progress against the tide. Sailing through the mooring field against the tide was not an option. 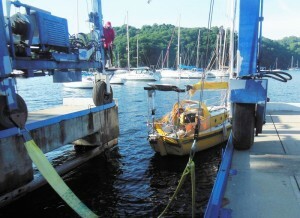 I quickly dropped the anchor again and as the club launch happened to be passing at the time, they agreed to tow me in. Time spent on the hard is always a bit of an ordeal and this occasion was no exception. Heat, mosquitoes, dust. After two weeks I’d had enough and decided to leave all non-essential jobs for ‘later’. 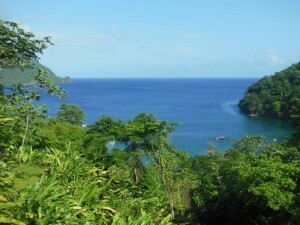 It was bliss to be floating again and as soon as I’d packed away the fenders and ropes needed for the relaunch, I sailed off to Chacachacare, a small island about 6 nm from Chaguaramas. The sail looked beautiful and it was downwind all the way. It was a weekday and I was the only boat there. While having a celebratory cup of tea in the cockpit I noticed a biggish white bird perched high on the branch of a tree close to the waters edge. I had a good look through the binoculars and saw that it was a big white hawk with mottled black wings. 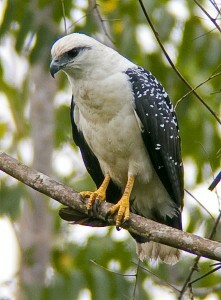 My birdbook identified it as an immature White Hawk. What a thrill – a completely new bird to me. The water was clear and I was able to swim again – a real treat after being anchored in the filthy water surrounding Chaguaramas. I spent a few days relaxing in the tranquil surroundings and then had to head back to town for supplies as I’d left before doing any shopping, so desperate was I to escape the turmoil. It was just a short stop and soon I was off again to another quiet spot on Monos Island where my friends on Saoirse Mor and Voyage were hanging out. 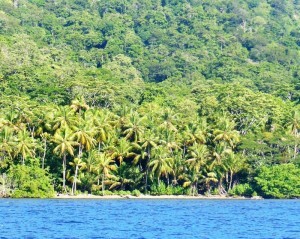 A wonderful place to be with a small beach and lots of coconut trees. There was much foraging for limes, coconuts and grapefruit. Too early for the soursops and guavas. There must have once been a small farm on the island. Now there are just a scattering of upmarket holiday places and a few more simple dwellings with permanent inhabitants. There is an influx of people at the weekends but nothing like the chaos of Scotland Bay. I plan to base myself here until I’m ready to leave. Now and then a quick visit for the day to go shopping in town and then back to this lovely spot. The others have left now, heading up to Grenada for Halloween so I’m pretty much alone. After experiencing how quickly the prop became covered with tenacious barnacles I resolved to find a better way of protecting it. Up to now I have always used the same antifouling paint that I used on the hull, but with the spinning of the prop it doesn’t last very long. No problem in water that’s clean enough to swim in as it’s easy to reach and I can get in and clean it off when necessary. But when the water looks too toxic this is not something that I enjoy doing. Before relaunching I sprayed the prop with an epoxy based zinc spray made by Petitte. It’s probably too soon to tell if it’s really as effective as I’ve been told it should be, but so far, after a month, it seems to be working. Just to be safe, as I plan to spend a few weeks at a time here in Monos, I have also tied a black plastic bag around the blades of the prop. I have been told that this should totally prevent anything from growing there. It will be interesting to see how it works. I’m not so sure about getting into the water in Chaguaramas to tie a bag on the prop, so anchoring there will have to be restricted to just one or two days at a time. Well, it’s a good idea to keep the boat moving anyway. 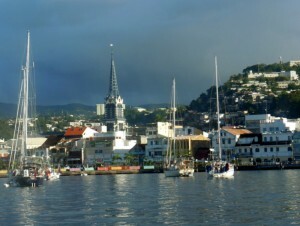 Yesterday I reluctantly sailed away from Charlotteville, heading for Trinidad and the boatyards of Chaguaramas. The time had come to get started on the myriad of small, and some not so small, jobs that needed to be done to keep Speedwell seaworthy. 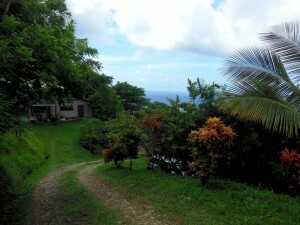 I had spent more than a month in the beautiful setting of Pirates Bay. 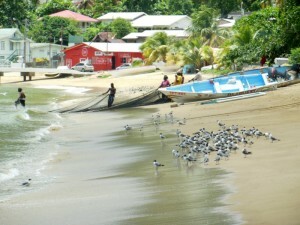 Walking along the main beach in front of the village, I would often stop to watch the fishermen hauling in their nets. These were mainly filled with small fish which they then kept in floating pens and used as bait for their main catch. 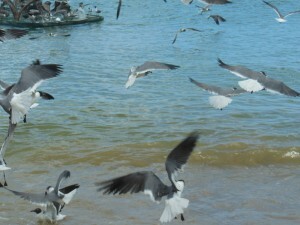 Each haul of small fish attracted hundreds of birds, eager for the pickings. Pelicans, frigate birds, terns and laughing gulls. Village children would also scurry about collecting bags of the tiny fish that fell out of the nets. Free food for the taking. The abundance of fruit along the paths and tracks that I walked was quite amazing. Everywhere I looked there was something lusciously edible waiting to be picked. 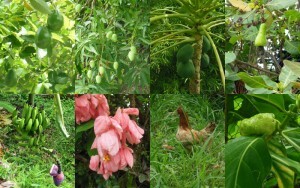 Breadfruit, mangoes, avocadoes, star fruit, papayas, coconuts, cashews and bananas. Many mangoes fell to the ground and I was always able to collect a few that hadn’t yet been pecked by the birds or free ranging chickens, and were still in perfect condition. How could you go hungry in a place like this? One of my more memorable walks took me along the road to Hermitage, a tiny settlement perched on a steep slope on the opposite side of the bay. Near the start of the walk I picked up a full bag of avocados which were lying next to the road. A few heavily laden branches of an avocado tree had been chopped down and just piled up as refuse. The bag was rather too heavy to carry on the long walk, so I left them in a secluded spot a bit further along. They were still there for me when I returned about 6 hours later. 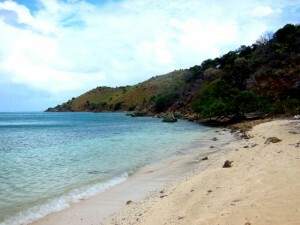 There were wonderful views across the bay and down to a small jewel of a beach tucked away and only accessible by boat. The narrow road winds along the coast, climbing steeply most of the way. 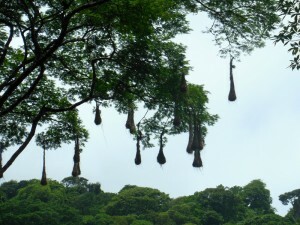 It passes through wonderful tropical rainforest and the birdlife is magnificent. The road is paved so I could gaze about me without having to watch where I was putting my feet all the time. 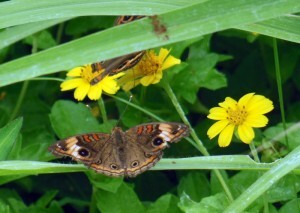 I spotted motmots, jacomars, cocricos, oropendulas and hummingbirds. I am very happy with my newish 10×42 binoculars which make it possible to get a really good look at the birds. Unfortunately my camera isn’t able to capture decent pictures of these frustratingly elusive subjects. It’s a long and thirsty walk and my water bottle was soon empty. 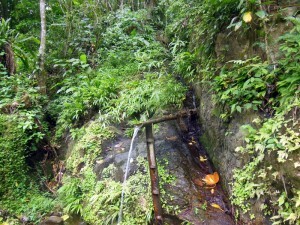 To my delight I came upon a beautifully contrived water spout running along a bamboo gutter. I took a well-earned break in the leafy glade and refilled my bottle with the cool clear water. I had hoped to be able to buy a cold beer when I reached the tiny village, but the best they had to offer was a brightly orange-coloured, artificial pineapple drink. At least it was cold and I could sit at a small roadside table with the stall-keeper and his dog. On Monday the village celebrated a Heritage Festival, demonstrating traditional recipes and music. I don´t really enjoy crowds and didn´t stay for long, but enjoyed watching two men use a long vertical saw to slice a big log into even planks. A family of Remoras had adopted Speedwell and were always there waiting for any edible scraps that I threw overboard. I had never encountered these fish before and was fascinated by them. They have a big flat patch on top of their head that acts as a suction cup allowing them to attach themselves to bigger fish and take advantage of any food nearby while enjoying protection from their host. My group ranged in size from about 20cm long to more than a meter, big enough to make me a little anxious about swimming amongst them in case one might decide to become attached to me. I like my daily swims around the boat, so had to pluck up the courage to get in there with them. They seemed mildly curious but never bothered me. I usually swam with a mask and snorkel so that I could keep an eye on them. Most days there would be other brightly coloured fish visiting. Now that I’m anchored at Store Bay 20nm further on at the southern tip of Tobago, three of the remoras are still with us. I’m not sure if they are new attachees or remnants of the Charlotteville group. It will be interesting to see if they stay with us all the way to Chaguaramas.